In early July of last year, as most of the nation was preparing to celebrate the Bicentennial, Ned Roesler '57, a Wall Street broker turned free-lance photographer, began a solitary trek from Alaska's northern tip on the Arctic Ocean. His plan: cross the monumental Brooks Range and head southwest over the Ray Mountains to the Yukon River. 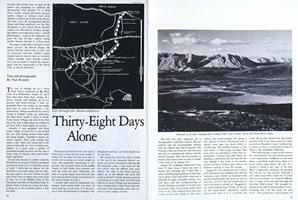 Roesler walked over 300 miles in 70 days, averaging slightly more than four miles - and 80 photographs - a day in the wilderness. He spent the last 38 days without seeing another human, the last 12 without food. The map at right shows Roesler's route (heavy arrows), the Brooks Range, the Alaska Pipeline (dotted line on left), and the proposed national wildlife refuge (shaded area in bottom inset of northern Alaska) through which Roesler walked. Next year he plans to resume his journey, again with the sponsorship of the Sierra Club, to Mount McKinley.